Meet the team, click on the tiles for more info! After failing to grow my own veggies, I realised there must be a lot of people out there like me so I worked to solve the problems associated with urban farming and invented the Vegepod! After successfully growing Vegepod in Australia, I moved to California in 2017 to start up Vegepod USA. Day to day, I focus on building relationships with customers and distributors and growing our footprint across the United States. I love working in this industry. It’s very satisfying to see so many people embracing gardening and growing their own healthy, organic vegetables at home. We make and sell a product that makes people happy and makes them feel good about themselves - how many companies can say that?! At Vegepod I look after the legal, finance, administration, HR, management, and strategy. Overall, I work as a coordinator role to ensure the business runs smoothly and efficiently, and our international expansion is supported. I love the Vegepod family because it’s exactly that – family. Everyone we work is close in some way or another and that makes it feel special. And, of course, the Vegepod is a great product as it works so well for both novice and experienced gardener. How nice is it to hear a story of a Vegepod with trolley wheeled into a community room inside a nursing home where residents who are unable to make it outside each day can see and touch their vegetables and herbs, giving them much joy. I’ve been with Matt and Paul since the very beginning of Vegepod when we were local to Terrey Hills. Since then it’s been fantastic to watch us grow locally and internationally. It’s hard to find a better industry than gardening. It invariably makes people happy and healthy, both in body and mind. That in turn makes me stoked. It’s not a slogan, it’s just reality that the Vegepod has made edible gardening available to absolutely everyone, in any location, whatever the abode, every single day and without fail. I’m the link between our sales and merchandising team and the end customer. I process orders online, ship products, answer the 1800 phone, take on special orders, and help with overall support and distribution. I love being part of the Vegepod family, watching the business grow (pun intended) and hearing stories from all over the country and world about how people are producing their veggies. I’m the Marketing Assistant for Vegepod Australia. I work part-time, during school hours at ‘ShedQuarters’ - the home of Vegepod. Day to day I support the team with all things marketing – managing the busy calendar of events and shows, PR, website and online platforms, social pages, product launches – the list goes on! Vegepod resonates with me as I’m a gardener myself and I value growing and harvesting organic produce with my kids to cook and share. It is so satisfying! The best thing about working at Vegepod is the many community programs Vegepod has to get kids, the eldery, disabled and other community groups enjoying the therapeutic, physical and social benefits gardening can bring! I am lucky to work with a great bunch. I started up Vegepod NZ, the first international market for Vegepod outside of Australia in August 2016. I look after everything to do with the NZ business from ordering stock and selling to talking to customers at events and exhibitions. Prior to joining Vegepod, I didn’t have a lot of interest in gardening. But after discovering what a Vegepod was, I instantly knew the potential for it to go well in NZ. And boy do Kiwis love them! I feel lucky to be involved with such a high-quality, innovative product that people really get enjoyment out of. I’m the newest member of the Vegepod team. Together with my fiancé, Alex, we left our corporate lives behind and are setting up Vegepod UK. I’m a jack of all trades (and a master of none) but I love building relationships and delivering high quality customer service. With Alex’s experience in marketing and my operational background, we’re going to take the UK by storm. Make sure you come and say hooroo to us and our Vegedog at the next event! After learning the ropes in the Australian business I have relocated to run the Canadian operation. I am constantly on the road meeting customers, attending trade shows and consumer exhibitions. I love working in the garden industry as it is a positive, happy and healthy one. It feels so good to sell a product I love and believe-in, versus insurance which is what I used to sell and hated it. The Vegepod is my dad’s invention, so for me, Vegepod means the happiness of building something with my family - as well as happiness for all the customers and people associated with it, I love it. As owner/operators of Vegepod Singapore, our role covers all the usual business aspects expect as well as the sales and marketing. We are the ones bringing stock in to Singapore, running the demos, and consulting with the stockists while standing at the booth! We were both inspired to join Vegepod after we saw what it could do in New Zealand. Singapore has a vibrant gardening scene with a lot of expats needing low maintenance gardening solutions – we knew it would be a hit! Aside from sales, as an educator, Philippa works on developing a curriculum, which includes elements and features of the Vegepod. We have been visiting community and school gardens to gather ideas and understand how other educators are integrating urban farming into their programs. The elements of community, sustainability, farm to table, and water efficiency are very exciting. I onboarded with Vegepod in 2016 and have happily never looked back! I travel around to our stockists and ensure their displays and stock are up to date. Vegepod has given me the opportunity to broaden my gardening horizons, I'm also able to share my passion with my children who have their own Vegepod and are now growing their very own veggie snacks. I love working in such an upbeat enthusiastic team who make the days seem more like fun than work. 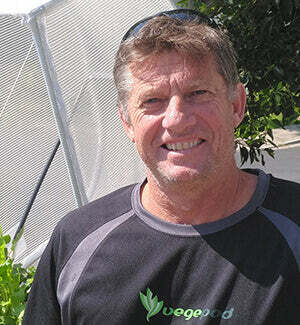 I’m the sales and merchandising representative for Vegepod in Perth, Western Australia. I visit the stockists, check on their sales, stock, and perform demos. I’ve always loved gardening and the satisfaction of growing things so it’s very exciting to be part of the gardening industry and the Vegepod team. Everyone is so friendly and happy - it’s a really great environment to work in. I represent Vegepod at gardening shows and events throughout South Eastern Queensland (SEQ) as well as managing the stockists here. My Vegepod journey is heartfelt! From a very happy customer and positive influencer of my friends and local community, to a dedicated and motivated employee - nothing makes me happier than sharing the benefits of gardening with others and, in particular, talking all things Vegepod! Everything about Vegepod has helped me grow - I now study Horticulture through TAFE Queensland. My role at Vegepod requires me to manage and maintain current relationships with our wholesalers. I love getting out on the road visiting existing stockists and finding new ones to house the amazing Vegepod! Working in the Garden industry is great experience as people are becoming more educated about what they are putting into their bodies and there is nothing better then eating the fresh veggies that you have grown yourself. Vegepod to me is creating awareness about how easy growing your own fresh veggies can be and it shows people that doesn’t matter where you are from, or how old or young you are, it’s simple, easy and fun! I work primarily in sales across the US, selling and making connections at our distributor trade shows. Besides that I'm training to be a local horticulturist up here in Grand Rapids, Michigan. I absolutely love working at Vegepod because there's nothing better than working with family and seeing a company grow with a product that actually works. We had one of the original pods from back in 2010 at our Terrey Hills home (when we lived in Australia). Now we’ve moved to the Great North and there’s a thriving industry with huge shifts in how health conscious everyone is being.